The kiddos will have to be torn away from the onsite waterpark. The onsite bowling alley makes for the perfect rainy day activity. Grab the latest critically-acclaimed novel and some sunnies, you're entering deep relaxation mode. Sixth-floor Oceans 6 Bar & Lounge makes a mean cocktail! 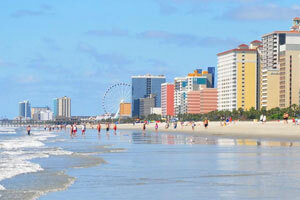 Just a few steps put you and your crew right on beautiful Myrtle Beach. Take a break from the action and chill out as you float down the resort's lazy river. A silly submarine and a sunken pirate ship are just a few of the attractions at the onsite waterpark. Conquer some coasters at Famiy Kingdom Amusement Park, just a 13 minute walk away. The resort has one of the largest heated indoor pools in Myrtle Beach. Splash Oceanfront Bar & Grill gives you those pool and ocean views you've been craving, with cocktails! Plan a vacation the kids will be bragging about at school at Coral Beach Resort & Suites. Spread across three and half oceanfront acres with more amenities than any other Myrtle Beach family resort, you’ll never, ever hear those dreaded words, “I’m bored.” When you arrive at your well appointed suite, the first thing you’ll likely notice are stunning ocean views from a private balcony, where you can greet each day while sipping your morning coffee in the fresh air overlooking the azure Atlantic. You can whip up your world-famous chocolate chip pancakes for breakfast thanks to a fully equipped en-suite kitchen, but if you’re not in the mood to cook (hey, you’re on vacation!) lead the way down to the Atlantis Restaurant and help yourselves to a hot breakfast buffet. Once everyone’s well-fed, prepare for a day of fun in the sun. Slather on the SPF, grab towels and head out. With various indoor and outdoor pools and hot tubs throughout the resort you could spend the day pool-hopping across Coral Beach - but don’t be surprised if the kiddos want to splash the day away at the onsite waterpark, complete with rain maker fountains and a pirate ship playground. Once the crew’s had enough sun for the day, move the party inside to the Entertainment Zone - which houses arcade games, an ice cream shop and even a bowling alley! Studio-style suites and one-bedroom condos at Coral Beach are well appointed and welcoming. Coming with either a master king or pair of doubles, plus a full-sized murphy bed in the living area of some suites, these bright and airy suites are prime for families of up to six. Full kitchens make home-cooking a breeze (and are handy for whipping up midnight snacks and sudden cravings). Flat screen TV with extended cable in the living area is a welcome perk on a low-key night in. Coral Beach has you covered for almost anything you might crave. From a Starbucks fix at the Coral Bean Cafe, to a tasty plate of fish ‘n chips at Splash Oceanfront Bar & Grill, or happy hour at the new Oceans 6 Bar & Lounge. For some fun off-property spend an exciting day at Family Kingdom Amusement Park, which is easy walking distance from the resort. Or head to the famous Myrtle Beach Boardwalk a mile away to enjoy casual dining, fun shopping, and great people-watching. Not to mention all the oceanic adventures to be had like fishing, kayaking, parasailing and jetskiing. Parking is available 1-spot per room, height-restrictions apply. Contact the office using the information on the reservation confirmation received after booking. Please note that pre-paid cards are not accepted as payment at this property. For more details, please contact the office using the information on the reservation confirmation received after booking.